Rangsa ni Tonun is the title of a 19th century text about Batak weaving procedures. The word rangsa in the Batak language can be translated as ‘description’. However, it is more than that. Part myth, part legend, it is infused with the power of origination. It is part of the oral repertory of a Batak guru or knowledge specialist (datu/shaman). Typically, it uses poetic language to describe procedures found in Batak day-to-day life. The Rangsa ni Tonun text was committed to paper by Guru Sinangga ni Adji in 1872 at the behest of a missionary, I.L. Nommensen, and subsequently stored in two European archives. The oral tradition of which it is a part has since died out. In the Rangsa ni Tonun text, the Batak guru explains that cotton is purchased on the market and then spread out to dry. The pits are removed when the cotton is fed between the rollers of the cotton gin. The de-pitted cotton is fluffed using a bow then rolled into so-called rolags to prepare it for spinning. After it is spun, the yarn is wrapped onto a reel. The resulting white skeins of yarn are dyed using natural colours from the leaves of the indigo shrub or the roots of the mangkudu tree. The blue yarn can be transformed into black yarn by submerging it in the mud of the rice field. To prepare the yarn for weaving, first it is starched using a rice mixture and then wound onto the warping frame. Afterwards the yarn is shifted to the loom. When the yarns are orderly, weaving can begin. The description closes with a reference to Si Boru Hasagian, the first Batak weaver from whom all Batak weavers are believed to descend. The Rangsa ni Tonun film was made between 2010 and 2013. The film medium was selected as the most efficient and effective way to translate the original text. While first English and Indonesian translations were made (a long process that I commenced in 1980), the text is so complex, arcane, flowery, antiquated and peppered with references to culturally-specific weaving techniques that visuals were more than necessary to assist someone trying to understand it in any language! MJA Nashir agreed to take on the task of filming the text. He first wrote a screenplay so that he could infuse a story element into the weaving descriptions. Together we combed the Toba Batak region looking for weavers who could execute the tasks described in the text and we also searched for the necessary weaving equipment, much of it no longer needed or used because techniques related to yarn production are no longer performed. The acting in the film was more-or-less spontaneous with Batak villagers either carrying out what we asked them to do, or us recording a serendipitous display in a village. The filmed version of Rangsa ni Tonun is dedicated to all Batak weavers, the descendants of the original Batak weaver referred to in the text. THE CREATIVE PROCESS OF FILMMAKING "RANGSA NI TONUN"
The Creative Process of Filmmaking "Rangsa ni Tonun" (Directed by MJA Nashir, Produced by Sandra Niessen, Music by Suarasama. With: Tihar br Sitorus, Sardi Tambun, Nurhaida br Regar & other Toba Batak Weavers). Regretfully this video may not play on IPads and some, older, IPhones due to some Flash player ommissions in the FaceBook code for embedding video. Click the link to view on original Facebook post. It should, however, run on a Windows PC and IPhone 6. The theme song of the film is a traditional, now extinct, weaving melody that I recorded in 1980 in Harian Boho as sung by my erstwhile weaving teacher, Ompu Sihol. The Batak music group, Suarasama, arranged and performed the melody for the film. Making the film was an unusual adventure. It gave MJA Nashir and I a close-up view of the current state of the art of Batak weaving. We saw how much had been lost and how and why it was so difficult to re-kindle what had disappeared. We noted how great the variations in Batak weaving traditions are from village to village and region to region. We noted the depths of memory and the losses of memory pertaining to the tradition. I wrote blogs about the process of making the film and then selected prominent themes from this experience to accompany the film in book form. The text certainly stands on its own, but it is enriched when the viewer learns about the circumstances in which the film was made. Upon its completion, we brought the film to villages around Lake Toba to share it with Batak villagers. This was Pulang Kampung number three (2013). It had an inspiring effect on the locals and the weaving tradition, now in deep crisis and in danger of disappearing forever. See a collection of posts on my blog about Pulang Kampung III. 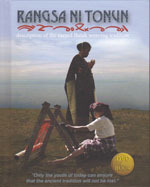 The set, dvd plus book, entitled Rangsa ni Tonun, is available in both Indonesian and English from the film director/filmer, MJA Nashir and the producer, Sandra Niessen.